R.E. 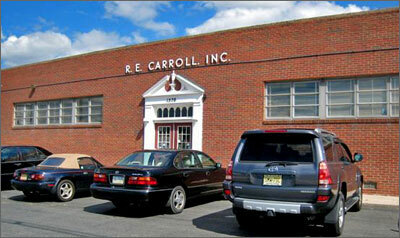 Carroll was founded in the early 1920's and incorporated in 1925 by R. Emmett Carroll and two of his brothers with offices in downtown Trenton, NJ using public storage area. R. Emmett Carroll was succeeded upon his passing in 1947 by his brother, James H. Carroll, who served as president until 1963 when his son, Robert B. Carroll took over. On his death in early 1987, he was succeeded by R. Emmett Carroll Jr., who served as president until March 2009 when he became CEO and his son, Robert Carroll III became president. The company moved to its present location in 1959, having constructed its own offices and warehouse, which now encompasses 20,000 sq. ft. with heated areas. More expansion is planned. The company has expanded to additional storage facilities in Kent, Ohio; Dalton, Georgia; and Dallas, Texas. The firm sells raw materials used in adhesives, ceramics, paint & coatings, plastics, rubber, and related industries. Products range from inert pigments such as calcium carbonates, clays, alumina hydrate, barytes, zinc oxides, zinc dust, sulfur, accelerators, all types of process oils, white oils, petrolatums, reference oils, specialty oils, lubricants, precipitated silicas, feldspar, rubber chemicals, waxes, magnesium carbonate and oxides, amides, fatty acids, plasticizers, and Gilsonite. The sales team consists of eleven people including Robert E. Carroll III, who since March 2009 has served as President, and Don Harris - Petroleum Products Manager. In August 2015, R.E. Carroll Inc. acquired J.H. Calo Inc. of Westbury NY, a family owned distributor of ingredients and additives for the fragrance market. J.H. Calo Inc. continues as a division of R.E. Carroll Inc. The Company is currently looking for new opportunities and markets, to continue growing the business. To email R.E. Carroll management, click on their name from the list below. IRM Testing Oils - PURCHASE NOW!